These slings hooks are popular because they are a modular option. Because of the half link on top, which can be removed with a simple hammer and punch, they can be added or removed from cables, ropes and chains as desired. 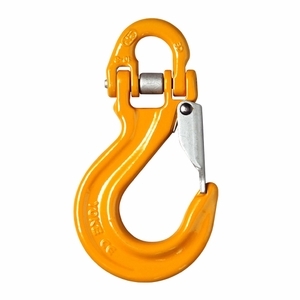 This has made them very popular for use on winch lines--one can use a hook, take it off when they want to switch to a shackle, or perhaps a different hook, etc. The profile of these hooks is very familiar, a standard sling hook profile that is very popular throughout the rigging industry, and works well with all kinds of rigging set ups. A heavy-duty, spring-loaded latch kit is included and installed prior to shipping. Made from Grade 80 alloy steel, each hook is proof-tested and certified. Safety factor of 4:1.